Our TEDxUGA team members love connecting with the local community to share their passion for ideas worth spreading. In the past, they’ve worked with groups ranging from the Downtown Development Authority to Clarke Middle School, but recently they turned their attention to an even younger crowd. 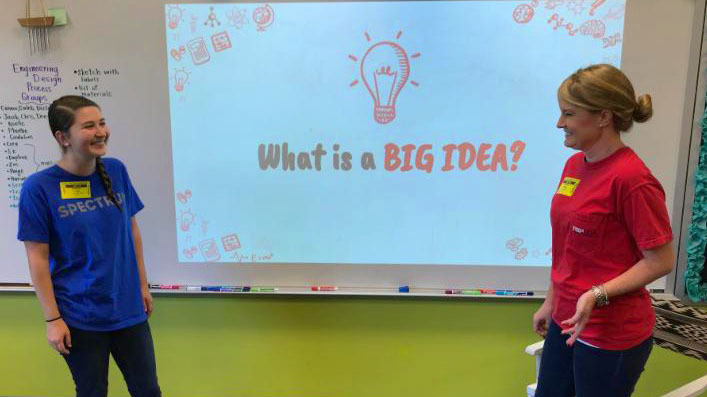 Earlier this month, Megan (TEDxUGA Licensee) and Kendall (TEDxUGA Assistant Curator) visited a class of 5th graders at Barnett Shoals Elementary to discuss their big ideas. The students have been working hard in class to craft their own TED-style talks, so Megan and Kendall helped them learn about the elements of a powerful presentation. The students were creative, curious, and ready to explore how they could make their big ideas even better. Maybe someday these students will find their way onto the stage at TEDxUGA!